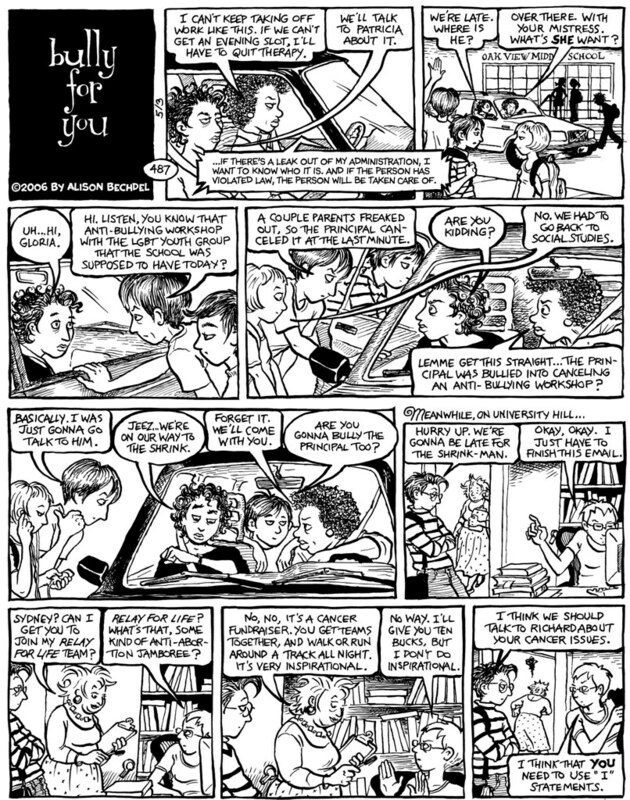 A most grateful tip o’ the nib to Nichael Cramer, who kindly posted the enlarged artwork in a pan-browser friendly version before we fixed the problem. This episode is based on an incident that actually happened in a town near where I live in Vermont. Cool strip! When are you starting your AVS pay-per-view biz? P.S. I wanna meet these shrinks. I bet they’re kooky people. Good! Clarice always seems to need something to make her angry and catalyze her out of her slump. Maybe Raffi keeps nettling her because he knows if she gets mad enough, she comes around. Ditto about the shrinks! I want to see what the sessions are like. Or Raffi could save it for his therapist. Love the strip – it just gets better. Forget the therapy sessions! I’m more curious about whether Sid and Mo and Clarice and Toni ever get over the infidility or if they finally split up. God, I am *so* with Syd. i love the strip, but am getting tired of Mo and Syd’s constant uncomfortable and awkward relationship, and i really miss Lois. when are we going to see more of her and the other gender variant characters? keep doing what you’re doing, Alison. you write a great strip without our help! !